Have you ever been in survival mode? Maybe when you just had a baby, or there was an illness in the family. Maybe there was a crazy week at work. I think we all end up in survival mode at some point (several times!) in life. Survival mode is when it gets easy to eat cereal 3 times a day. We might start buying our bread again instead of making it at home. The laundry piles up. The layer of crumbs on the floor thickens. The kids are stir-crazy from maaaaaaybe a little too much TV. I've been there a million times, and I'm there right now! I never would have guessed that being away from my house for three days would shake my routine up the way it has. It's certainly not my first time in survival mode and I'm grateful to realize that I've learned a lot about maintaining a healthy lifestyle… even when life is crazy. It's so easy to slip into eating processed garbage when things get hectic, but it's not worth it! It will only make you and the rest of your family feel like crap and screw things up even more. There are a couple ways you can simplify healthy eating and the one you choose will depend on where you're at right now. If you are not in survival mode right now, and are just reading this post to stash away the knowledge for the future, you should start stashing meals in your freezer. It's easy. Just make double of whatever you're doing for dinner for a few nights and pop the leftovers in the freezer. When a busy night rolls around, you can pull it out to heat + eat. Food for Life bread is usually found in the freezer section of the “health” aisle – you'll know how that translates in your grocery store. These breads are EXCELLENT. They have a sprouted version that I love and some awesome tortillas, including a gluten-free version. 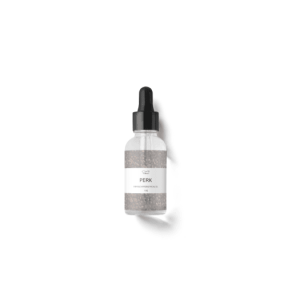 Hemp hearts – these yummy little seeds are so nutritious, and it's really easy to sprinkle them on salads, cereals, and yogurt to upgrade it to superfood status. TeeChia cereals. So if you're going to go with cereal for meals, this is a good brand to go with. It's all natural and has a ton of super grains, with dried berries and nuts or seeds, depending on the flavor you get. So good! Yogurt. Probiotics are your friend right now! And it's just so easy – it's already ready to go, or you can add fruit, nuts, seeds, or grains to bulk it up and make it more of a meal. Lentils. I loooooove lentils. You can make them with rice super quick – no soaking required. Soak oats: Put oats, water, a dollop of yogurt in a covered bowl on your counter before you go to bed. Breakfast is done! Don't get sucked into eating out every night while this is going on. You'll save money by just buying the healthy “convenience” stuff. And you'll feel so much better when you get through the insane season. If you're in survival mode, it's safe to say you're probably stressed. Your immune system needs babying right now to keep you well. Good nutrition is the key to that, but supplements can fill in the gaps. Nordic naturals has an omega supplement that helps the body respond to stress in a healthy way. Athletes take it – it helps your brain, your heart, and your immune system. A good multivitamin. I take Opti-women, which has an antioxidant blend as well as whole-food sources of nutrients. Again – filling in the gaps. You need to do a certain amount of nothing in order to remain physically and mentally healthy. It really is okay if the dishes pile up a bit or if your child's face goes unwashed for a while after dinner. AT ALL COSTS, find 20 minutes somewhere to just sit and do nothing. Your sanity is at stake! When I don't have time to keep the whole house clean, I try to just keep the living room floor picked up (mostly so I don't go crazy from the visual clutter), the bathroom wiped down, clothes clean (forget folded), and the kitchen straight. The kitchen is the hardest for me, but we haven't gotten food poisoning to date. The point is, don't go moving the refrigerator around or anything like that right now. Nobody can do it all, all the time! It's okay to ask for help. I am blessed with an awesome mom AND mama-in-law who are always willing to come watch my kids. They usually get really crazy and wash some dishes and fold some clothes while they're here. I'm spoiled rotten! Do you have family nearby that you can reach out to? Another mom with older kids who need service opportunities? 😉 Just ask, and try to return the favor when you can. Sometimes getting help might even just be hiring someone to come clean your house for a couple hours or mow the lawn. Do what you have to do! 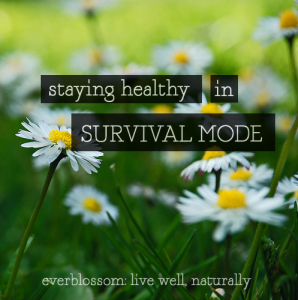 Have you ever been in survival mode? How have you made it through? Good nutrition and lots of water are my tricks to staying healthy! I am very familiar with Survival Mode and work hard at trying to stay out of it! lol…It is completely acceptable with the stressed of work, family, life in general to expect lots of bouts of Survival Mode. Recognizing when you’re there can be tricky! Great tips especially about simplifying food and taking supplements! These options sound really delicious! I think I’ll try few of them. Thank you! Kylie, what a wonderful post and just what I needed! I focus so much on getting the kids’ diet right that I suffer – so does hubby – now that we are in the super busy seasons. Thank you. One of the best posts I’ve read on the topic – wait, scratch that, maybe the only one! Thank you. So glad it was helpful, Gina! Some days I fear that I will never leave survival mode! I don’t eat clean, but became vegetarian recently. Considering my family did not switch, it has been interesting. Especially as I dislike raw veggies! I absolutely love lentils. I am going to make lentils today because it is one of those survival mode days for me as I struggle with menstrual cramps. Thank you for the reminder! I need to get into a habit of having meals prepared and frozen for days (or weeks) like this. Its too easy to tell the hubby to pick something up on the way home from work. I just checked out the TeeChia cereals and they are something that I can eat on my current diet – I may have to really see what they are all about. Yes, they are so good and gluten free! I don’t know how long the bee is going to stay in my bonnet but lately I’ve been feeling the need to clean all the time just so I don’t have to do one big job later on. I think that my bit to have my “survival mode” working. I do get what you mean though. We tend to do things out of convenience and it just hurts us in a bigger way because we like to take short cuts, especially with the food we eat.